In 2006, my wife and I, began construction of an indoor riding arena for our private use in Labertouche Victoria. The project has taken over 2 years and we have learnt a considerable amount about building arenas during that period. These pages are devoted to some of those lessons so that others do not have to learn them through experience. When we started the project finding information about arenas and buildings proved quite difficult we were lucky to have access to a number of people who had experience and did a lot of digging for information. The process of getting to the finished arena started with designing and siting the building. Next the site was cleared and the base installed. Following on from the base the building itself was constructed and the services (electricity, light and water) installed. 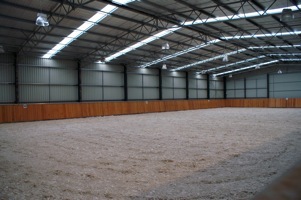 The building was fitted out with the construction of the wash bay, stables and arena wall. Finally, the surface was installed on the arena. We were delayed nearly a year by the black Saturday Fires on February 7, 2009. This necessitated the complete replacement of roof, and the sieving of all the arena sand. These pages are a work in progress and will be updated as I find time.